Welcome to my collection of Foodie Pro tutorials for users who want to get their customisation on! If you’re looking for my full review of this remarkable Genesis child theme, click here. I recently moved my blog over to Shay Bocks’ Foodie theme for Genesis and a little later she released Foodie Pro. I was absolutely thrilled to receive the free update she offered to existing Foodie users (thanks Shay!) and jumped right in to change over and start styling it how I wanted. I get a huge kick out of making CSS edits. I have to feel out everything I do by reading tutorials on the internet and tweaking, reloading, tweaking, reloading. Very, very soon, I will have to drag myself away from all this tweaking and get back to the all-important job of writing delicious food content, but before I do that (soon, I promise!) I wanted to share with you the edits I made and the Foodie Pro tutorials I wrote as a result, in the hope that they will help someone else out there. 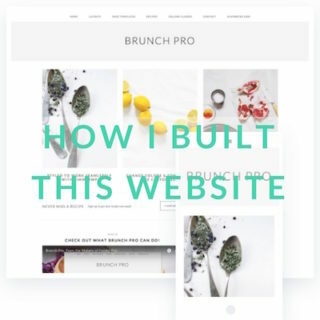 I don’t touch upon how to set up your Foodie Pro site here – Shay and her team have written comprehensive tutorials on the basic set-up and will provide one-to-one support to get your site looking as they have laid out in the demo. The changes I discuss here are ‘customisations’ – changes that the Foodie Pro team do not cover in their technical assistance. Some of these changes took me DAYS (WEEKS!) to work out! This may be because I have no training or education whatsoever in website design, or it may be because I was working on it too late at night, for too many hours at a time. But with luck my mistakes and frustrations can help you get your site looking exactly how you want without too much pain. I plan to keep updating this post with future edits I make, so if you don’t find what you’re looking for here, feel free to pop back and check again in the future! If you have any questions about how I styled my site or would like any help, do leave a comment – I will try my best to help you, but be warned, I am not a developer, just a blogger feeling my way around the code. If you have made any other edits to Foodie Pro or you have any of your own Foodie Pro tutorials you would like to share with the world, I’d love to hear about them as well. Perhaps you can help me and we can all be happy together, styling our little blogs and making them look just as beautiful on screen as they look in our heads and in our hearts! Some of these mini tutorials are general Genesis edits and some refer to popular plugins often used with blogs such as this, but they are all things I felt moved to change on my Foodie Pro theme, so I am including them here as part of my guide. Want an above-the-fold leaderboard ad in your header, but don’t fancy the placement of the Top Ad widget? This tutorial’s for you! I didn’t really want my header leaderboard ad to sit in the middle of my header, the first thing any visitor would see when they entered my site. I also wanted a Hello Bar at the top of my site, drawing new readers into signing up for my (amazing!) newsletter. Instead I wanted my logo to the left, where the reader’s eye is naturally drawn, and my first advert next to it on the right, rendering the header much shorter with more content visible to readers before they start to scroll. Foodie Pro theme is fully responsive, with the site display tailored to the different widths of phones, tablets and desktop computers. There are many, many reasons to keep the responsive themes that come with the Foodie Pro theme, the most important of all the decreased loading time they offer for smaller devices. Find out why I decided to get rid of it. One of the best things about Foodie Pro is the large number of widgetised areas, allowing you to place all kinds of content – text blocks, ads, icons, search bars, social networking links, almost anything – in various positions across the page. This enables you to easily build a magazine-style layout and include all the things you really want on your blog. But being a bit obsessive about such things, there were minor changes I wanted (needed!) to make, just things that needed to be moved a little bit, or resized slightly. If this is how you get your kicks too, this tutorial will help you tweak your Footer, After Entry and Sidebar widget areas. Learn how to make your own (beautiful!) text link index, like my one here, a great addition to the Foodie Pro visual recipe index. A text link index allows you far more flexibility as you can link multiple times to posts that may have more than one recipe component. For example, you can include all the sauces from all your recipes that have a sauce element, linked with the title of the sauce, under the heading ‘Sauces’. In an automatic, category-based visual recipe index, the featured photo and post title will make this look confusing and odd. Another benefit is you can make as many of them as you want! Now I have to contact Shay about upgrading to Pro (I never got that possibility to upgrade). Thanks and I will read your post in more depth once I’ve got Pro installed. Hi Eva! Really glad to be of help! I spent ages fiddling around with things and working little bits out here and there, I’m very happy to be able to pass on any of that knowledge. Where did you buy your copy of Foodie from? I was able to download my upgrade from my profile area on Shay’s website, and I think it’s the same for Studiopress. Let me know if you have any questions! Hi! Your site is so beautiful! I am a new blogger and am setting up my foodie pro website-I was wondering how you set up different recipe indexes for the sweet and savory- I tried setting up different pages but then the recipe inbox wouldnt differentiate between the two. Any help would be appreciated! Gonna look through your other tutorials. thanks you!!! Hi Sam! Thank you so much for your lovely compliment! Smiling! What do you mean exactly? Do you mean these pages – Sweet & Savoury? My Sweet and Savoury sections aren’t recipe indexes as such, they are pages that display all the posts I have labelled with the category “Sweet” or “Savoury”. My Foodie Pro recipe index is here. If you want category pages like the ones I have, you can make links to them in the navigation menu by choosing Appearance/Menus/Categories and then choosing your category to add. Or you can add links to pages that display only one particular category anywhere on your site with the link http://www.yourblogname.com/category/nameofcateogry. Does that help? Let me know if not! Hi Jess! Thank you so much for your comment! Do you mean that you want a horizontal divider under each featured post? I’ve been pondering your request… I’m not completely sure how to achieve this. Do you have a widgetized homepage? If so, you could probably just add a widget with code for the divider image that you want to display between each featured post widget. This is what I do in the sidebar with the pictures of pink and grey leaves that I use to separate some of the widgets. Might that work for you? Thank you for chiming in! Wonderful to hear other people’s tips and successes editing Foodie Pro. I had a look at your site – it looks great! I love what you did with the ‘read more’ buttons. Beautiful! Gosh, I forgot to ask, what do you use for comments? I really like your comment system! What exactly do you like about the comments? I am just using the standard Foodie Pro comment system, but I have edited the CSS to style them a bit differently. Am happy to help you with the code if you’re interested. Ooooh really??? I’m definitely interested. I love the “If a new comment is posted” part! If it’s the styling you’re interested in, I’m planning on writing a tutorial about how I edited that area very soon. So much to do, so little time! Damn my real full-time day job! OMG! This is exactly what I’ve been look for, I’ll get it installed! THANK YOU! I know exactly how you feel, my “real job” totally gets in the way of blogging! LOL! Sorry to hear that! Just to double check, did you definitely put the code in your function.php file and not your style.css file? And did you clear the cache on your browser before checking if the changes had been made? I ‘may’ have been at my wits end again with this blog yesterday, so I tried again this morning. I did paste the snippet at the end of my functions.php and I did clear my browser cache, but it’s still down there. I don’t get it! Which version of Foodie Pro are you using? Perhaps if it’s a later version (I’m using the first version), something has changed? If you do work it out, please do come back and let us know how you fixed it! I will add that I have a vague recollection of adding that code to my functions file and it not working, then trying again later and it working. That doesn’t really make any sense, and I have no idea why that could have been, but for some reason it’s ringing a bell. I just wanted to second Nancy’s comment about what you did with the “Read More” links. Would you mind sharing how you changed this? NANCY I FIGURED IT OUT! It’s only taken me several days of trial and error, but I finally got it! Here’s what worked for me the very first time. 🙂 And the plug in you suggested is perfect, just what I was looking for! My comments are all set! Thank you, thank you, thank you! Fantastic! I wonder why our sites needed slightly different code? Were you using a different version of Foodie Pro? Just out of interest. Glad you fixed it. I too have a strong desire to write things in capital letters when edits ARE FINALLY SUCCESSFUL!! That same code worked for me as well when I changed it. Thanks for sharing! Maybe I don’t have to write that comments tutorial now! I’m trying to replicate your work on the comments section but when I added the code (and I tried both versions) the php totally went beserk and the site went down. I’m wondering if perhaps I’m placing the code in the wrong place? Should I be adding it to the bottom of functions.php in the Foodie Pro childtheme section of the editor or under the Genesis section? You should be adding the code to the bottom of the Foodie Pro child theme functions.php file. Is that where you were putting it? If so, what exactly happens to your site when you do so? 🙂 Who knows! I have the most recent one, I just downloaded and installed it within the past month. Hi Nancy – I have been trying to get lines between my featured posts on my home page for days. You mentioned, “just add a widget with code for the divider image that you want to display”. How can I do this to get a line between each featured post? I’ve emailed the foodie theme and they had me add code to my CSS and it wont show up – all my other CSS edits are showing up, just no this one. Would love any info on this. Hi! Love what you’ve done with foodie pro & found your tutorials extremely helpful! I’m working on tweaking my site at the moment (note to self don’t change your theme at 7pm mid week..) and wondered if you’d mind sharing what plugin/widgets you use for your related posts and also the Instagram feed – they look GREAT!!! Hi Gemma! Welcome! So glad to hear that you find the tutorials helpful. They kind of twisted my head to write them, so I really hope people are able to understand them! I’d be very happy to share my plugins with you. For the related posts I use Shareaholic. I don’t think the related posts it offers are actually that related, but I really like how they look! The Instagram feed is generated by a website called Snap Widget. You visit the site and generate code for your widget, then you paste that code into a Text widget. I love how this widget displays, but my only reservation is that it doesn’t actually link to your Instagram account. I think the Pro version does, but the one I’m using doesn’t. I often wonder if people click it and end up disappointed. Just so you know! The font in the comments section is the one I use for the body text right? It’s called Raleway if you’re wondering! Do you have any fab plugins/widgets to recommend? Thanks for that, really helpful! I’ve also just discovered that I’m having browser compatibility issues with internet explorer – images & texts running way oversized and off the page. Any thoughts as to why that might by and potentially how to combat? I was working on some mail chimp RSS emails and it was making them go haywire!! plugins I think are brilliant are Tweetily, and the WordPress calendar editorial – really handy for trying to plan out posts. Have installed Tweetily, but haven’t quite got round to activating it yet. Was umming and ahhing between that and Evergreen Post Tweeter. Would LOVE to have my Twitter automated as I really don’t enjoy updating my account. Too few characters! Not my forte! Hello Nancy, I tried Snap Widget, free version, but I didn’t like because once you click on the image link will not connect to your Instagram. Same thing with Websta widget. But Lightwidget free version will do the job and once you click on the image you get linked to your Instagram page. Yes, I didn’t like the fact it didn’t link, but I couldn’t find another free version when I was looking. Thanks for the tip! Love the turmeric tea post by the way – have been meaning to experiment with that myself! Hello! I just discovered your beautiful site today as I’m ripping out my hair trying to tweak my own Foodie Pro theme! I love your customizations & your content, and I’ve bookmarked your site to spend more time exploring (when my brain isn’t so fried!). A few quick questions, as I’m not finding answers elsewhere. 1) For some reason my header is not centering for one of my blogs (http://philosophicalmom.com). It seems to be aligned left whether I’m on desktop or mobile. My other blog works just fine (http://empiricalmom.com), and I swear the tweaks and settings for each are the same. Any ideas what’s going wrong? I don’t really want to disable mobile responsiveness at this time. 2) How did you change the hover colors for the dropdown menu items in your top menu? Default is black (and I noticed yours is a sandy tan color), but I can’t find a way to tweak this one thing. I’m not super techy with backend stuff, but I’m pretty good at figuring things out with some help. Thanks so much for any help you can offer! And now I’m inspired to totally re-do my minimal look to something more beautiful like your site! Hello Katrina! Very curious! I had a look at your homepage using Firebug – do you use that? It’s an add-on for Firefox and lets you right-click on any part of your site (choose Inspect Element with Firebug from the drop-down) to see the code for that particular part of your site. Anyway, I did that and it definitely seems to be aligned to the centre – in fact the CSS looks identical for both sites. Is it possible that you have a widget placed somewhere in the header area that could be shoving it to the left? A widget that you aren’t using, but is still in position? Are your widget arrangements identical for both sites? Long shot! Hello! Thanks for getting back to me and trying to help! I do use Inspect Element on Chrome. I sort of know how to use it, but not very well (it’s on my list of things to learn!). I definitely don’t have any widgets pushing the title over–I’ve checked and double checked. In fact, I ended up e-mailing Foodie Support yesterday, and even they are stumped as to why it’s happening. They suggested I edit my CSS to make the title width bigger, but then it messed up the centering on any device smaller than a laptop. I’m actually going to update my theme today to the latest version (2.0.5) and see if the problem corrects itself. Since this a relatively new theme for me and I haven’t yet published all of my previous blog posts from my old blogs, it won’t be a huge hassle to update the theme and re-do all my settings. P.S. You wrote about how if you use Simple Social Icons more than once on your site it copies the style settings, and you figured out a workaround. Did you post about this or can you point me in the right direction for a fix? P.P.S. I owe you for your time & help! I’ll try to repay you by spreading the word about your blog on my side of the pond! Plus, I can’t wait to try your Miso Umami Broth with noodles recipe! Looks delicious! Yeah, I sort of know how to use the Inspect Elements too – enough to have a fiddle around! I definitely think that you should persevere with the official Foodie Pro support team. This definitely qualifies as getting your site set up to look like the demo site, which is within the scope of their support. They have a small team of developers working on support, so if you can get them to help, it’s definitely your best best. I wondered if it was the length of the title that was the problem, but when I reduced the font size, the problem still occurred, so I don’t think it is that. Please do keep me up to date with how you fixed it – I’d really love to know! I haven’t posted about Simple Social Icons yet, but because my fix was only partially successful I haven’t written it as an ‘official’ post yet. But I’m happy to share it with you if you can live with a partial fix! I was able the change the background colour, but not the hover background colour – the colour that is displayed when the mouse cursor rests over it. Also, I would have liked to make the background colour transparent – it would have made my background flower image display correctly underneath the icons at the top, regardless of the screen size – but I couldn’t change that. I can’t say the Simple Social Icons support was hugely helpful – they just told me to ‘edit my CSS’. Anyway, here is the partial fix that I worked out. This piece of code should be placed at the bottom of your CSS file and it will set the background colour of the social icons in the sidebar to white (#fff). If you want the colour to be different, just change the #number. If you have social icons in a different location that you want to change (say, the footer), you would change the “.sidebar” to the code that matches with that area. For the footer it would be “.site-footer” – does that make sense? So far, I haven’t been able to change the hover colour. It just won’t change! Also, as I said before, ideally I would have liked to be able to set the background as transparent, but changing the background colour to #transparent didn’t work either. But that’s what I used – let me know if it’s helpful! P.S. I’ve been feeling a teeny tiny bit bummed about my blog and its progress at the moment, so I received your lovely compliment very happily and emotionally. Thank you very much! And you definitely don’t owe me anything! I have been helped by kind people across the internet many times and I’m just giving that back. Good luck! Thank you for the Simple Social icons fix. I appreciate it! So to fix my header problem, Foodie Pro support couldn’t figure out what was wrong either. But I ended up upgrading to the new version, and it fixed itself. So I guess problem solved, even though I still don’t understand what was wrong in the first place–maybe too much tweaking on my end? Anyway, I ended up re-doing my entire design and redirecting my domains to just one main domain (my name), and your tutorials came in very handy! I’ve still got a ways to go to get it how I want it, but I’m sure you know how it is—always tweaking! Your design is beautiful, your recipes, posts, & pictures are great, and the blogging tutorials are icing on the cake, so to speak. Don’t give up! I truly appreciate your words of support. I have a huge amount of enthusiasm for blogging, but I was just feeling a little bummed about a lack of specific progress. Have had some really nice feedback recently (yours included) so and feeling better now! I’m not going to give up! I am having this exact same issue on a site I am working on (not my main site). I only just downloaded the theme so I assume it is current. How to I access support for the theme (it was purchased via studiopress). You need to access support via the Shay Bocks website, but they will only help with setting up the theme like the demo, they won’t help with stylistic adjustments. Hence the tutorials! I am very interested in the Foodie Pro, but I want a homepage like yours (without the slider). Is that easy to achieve? Yes, it’s very easy to achieve. In fact it’s easier to not have the slider than it is to have the slider, if you get my meaning! To have a slider, you need to download a plugin and drag the widget that it creates into the appropriate widget area for your homepage. To not have a slider, you just don’t do any of that! I have written a full review of Foodie Pro where I really go through what I consider to be the pros and cons (mostly pros!) of this theme if you’re interested: Foodie Pro Theme: A Complete Review. As a recent devotee of Foodie Pro, I really appreciate you taking the time to map all of these issues (and solutions!) out. There are some terrific ideas here, and things are explained very clear. Well done – and thank you! Thank you so much Ksenia! I must say, it did pain me to write those tutorials because I had to check a million times that everything was correct so I didn’t totally break someone’s site! I have found feeling my way around web design to be extremely enjoyable and rewarding and I wanted other people to get a taste of that. I’m really glad you and others find them useful – that makes me happy! I want to tell you that your page is the best! I admire your determination in making it how you wanted it to be. Thank you so much! I absolutely love Iceland, it’s one of my favourite countries and peoples! Do you have a link to your blog? I’m not sure exactly what you mean. Do you mean that the picture always displays in that size (portrait) and your picture is being stretched? I just wanted you to know that I will try to have an answer for you (and your email) very soon – it’s been crazy busy these past few weeks! Just so you know I haven’t forgotten you! I would just like to say thank you for all the information you’re providing on Foodie Pro. I’m setting up a blog for my wife and your site (besides all the good food, beautiful photo’s, nice recipes and other stuff 🙂 ) was one of the most helpful ones. Thanks a lot!! Made my day! Really appreciate your kind words and very glad I could help! Your tutorials have been an absolute lifesaver! Thank you so much for sharing this knowledge. I’m planning to make some changes to my blog this weekend so that I can have a leaderboard ad in line with my logo as you showed us. I did have one quick little question which I’m sure has a simple answer, I just can’t find it. Where exactly did you go to make the size of font in your top menu bar larger? I think you just find this piece of code in your style.css file (see directions in the tutorial posts about how to do this safely) and change the “font-size”. This worked like a gem – I knew you would have the answer! Thanks a million! What great info and your site is gorgeous. I wrote a comment to you over the weekend, but when i hit ‘post comment’ I didn’t see it post on your wall…so I’m going to try this again! I apologize if you receive this message in error twice. 1) Do you know how to insert the ‘search’ into the main nav bar? I know this requires some code changing, but where can I access the area where the code would need to be altered? I think I have found a code for this. 2) I’m still building my site, and testing posts/different looks…etc. Once I go live, will those posts reflect the date I posted them? In other words, if I don’t go live for another few months…the recipes/posts I have in testing right now will be old (or not seasonally relevant)…so do I need to be delete the posts and rewrite since I don’t want these live or to display in the current order? Can I just keep pumping content and recipes into the recipe index, or does each recipe need to be a post first in order to land in the recipe index? Should I keep adding recipes or posts, and then worry about the order of the timeline after Can I change the timeline? 3) I’m kind of stuck on next steps. Maybe it’s time to create an editorial calendar. Although I am still working on the logo. Do you know how to alter the code in order to have my logo placed in the nav bar and in the center? I think this is enough for now!! Don’t worry, your first comment did go through, I just moderate all new commenters and I hadn’t got round to it yet! In answer to your first question, I haven’t done this myself, but a quick Google search revealed quite a few pages discussing this, so I suggest you give them a go first. Second question! No, you don’t have to rewrite the posts, just edit the ‘Published On’ date in the Publish section (top right) on each post to display the date you want. Each recipe does need to be a published post to appear in the Recipe Index. I don’t quite understand your last question – do you mean that ultimately you want your logo in the middle of the navigation bar? I don’t personally know how to do this, but if you do a Google search on editing a Genesis navigation bar, you will probably find the answer somewhere! I love your foodie pro based blog. It is great what you can do with that theme! There is one problem I have and I was hoping you can help me with that – is it possible to include tags to the search box in the recipe index to the same field where categories are? And also I would like to categories to the tag cloud. Thank you! These issues are specific to WordPress, rather than to Foodie Pro. This plugin will enable you to make a Categories clous as well (https://wordpress.org/plugins/wp-category-tag-could/), but I don’t know how you would put them together. Most likely it would require some coding that is beyond my ability. I suggest that you do a very thorough search for widget plugins that do this – perhaps someone has built one. The same applies for your second question – you will need the correct widget to drop into that recipe index widget area in the Foodie Pro theme. Someone might have built a plugin to do this, so do a thorough search for that too. I want some help in setting up a “Contact” page using foodie pro. I have “Leave a reply” section beneath every post. However, I would like to setup a separate contact page on my website. Would you be kind enough to help me with this. As setting up a contact page is covered by the official Foodie Pro support, I’m going to recommend that you contact them instead. They are defiinitely best qualified to help with things within their remit. Good afternoon. I appreciate your work regarding blogging. Trying to make a site just right can be frustrating to say the least. I am hoping you can help me with something. The footer links in my site (standard with the foodie pro theme) are causing issues with regards to usability for mobile users. I want to remove a few links and make them bigger (easier to tap hence google likes it more). I see you have altered yours. Can you advise on this? My site is polishpotterystore.com and I have already tried the simple edits plugin. That did nothing. Thank you! If you want to make the footer text bigger, find this in your Style.css file and edit the font-size. I hate one more question. I want to create a landing page similar to yours. A sort of thank you page after commenting. Can you help me with this? Thank you! I use Comment Redirect by Yoast. You basically make a separate Page in WordPress and then the plugin directs commenters to that page. If you mean what I think you do, you set whether the comments are displayed in the widget areas, inside each individual Foodie Pro Featured Posts widget. One question: how did you make the 4 seasons on the sidebar? Is it also using the Featured posts widget? To make the seasons sidebar thing I first made a four jpgs with the season written on each of them in my blog’s font. Then I uploaded those images to my WordPress media library. Then I added the following code to a Text widget (not the Featured Posts widget) in the Primary Sidebar section of my Widgets. You should replace the image paths with your own uploaded images and the category paths with your category web address. You might have to tweak the px size of the image in the code if your sidebar isn’t exactly the same size as mine. Let me know how you get on! Perfect! Thank you so very much 🙂 Will try it soon and let you know how it goes! Have a lovely day! Dear Nancy, I finally got around to creating the seasons sidebar on my blog and I love the way it looks! Haven’t categorised all the recipes yet, but I love it!! Thank you so very much for sharing your code! I just took a look – it looks amazing! Well done on getting it done! Hi – I am very new to blogging and I am using foodie pro! I just want to say your site is beautiful and I can’t thank you enough for all your information. I am finding it all so very helpful! Really, really happy to help! I think what you’re asking for is part of the normal Foodie Pro set up – you just drag the Genesis eNews Extended widget into the Top Ad widget area. Beautiful website (we are on a similar page food wise!) and hanks a lot for this post. I would like the text links to be a different color to the normal text and possibly not underline them as well. I’ve tried to do it through the wordpress Cutomizer, but then everything seems to change color (also Read More buttons on the home page). I’ve also tried to add custom CSS but that didn’t work either. So not sure what to try further? I would be great if you could let me know what you did to make this work for you. Thank you in advance. My sincere apologies for the late reply, I’ve been really snowed under. Thank you so much for your answer Nancy, very kind of you. I found out that I needed to change this code, but couldn’t find where it was sitting. So in the end I asked Shay’s team for some help and they pointed me in the right direction. All done now! Hi Nancy, hope it’s ok for me to jump in here 🙂 I’ve been trying for days to change the colour of linked text by changing this part of the code but no matter what hex code I try, it remains the same. I’ve managed to remove the underline but the colour change refuses to happen. Please help! Have you tried adding !important after the hex colour? This often helps me. If it doesn’t work, let me know and I’ll try and take a closer look. Your tutorials totally helped me set up my site earlier this year. Thanks a ton. However, I did a blogging no-no and messed with my functions.php. I was able to restore it and get my site back up, however there is one thing that appeared after restoring it. If you look on my site eatstylecreate.com you will see that above the navigation menu it literally says “main navigation”. This (along with a couple other things just appeared after my restore). Any idea on how to get rid of it? Sorry to hear you’re having problems- how did you restore the functions file? If you uploaded a clean copy (from before you made the changes) it should return everything to normal. Sorry I can’t be more helpful – I don’t have very much experience with the ins and outs of the functions file! You would need to change my webpages for your own. One thing I have just discovered that I like about this plugin is that it updates your copyright year automatically – so I was able to cross that off my to-do list without even having to do it. What have you linked to in your contact area? I have mine linked to my contact page, but if you want an email to pop up, you need to write mailto:EMAILADDRESS – is that what you’ve set it to? You might need to add !important after the colour hex if it doesn’t change. Let me know how you get on! Thanks a lot for your tutorials, they’ve really helped me out and I can’t thank you enough! I just have another issue with the “Travels” page of my website. I made “Travels” a category page so you get an overview of all the restaurants in different cities. However, I would also like to add a static ‘intro’ text above it. Is there a way to incorporate this into the theme? I tried to put the text into the category page description, but nothing shows up. Thanks a lot for your help, it’s been such an inspiration. In fact, you could pretty much follow the recipe index tutorial, but instead of creating page jumps, just link the image to a category. Thanks for your great help, I will check it out! I think this will indeed exactly do what I want the page to look like. It is great to see how much time you put into answering messages and helping people around the world. Thank you for your help and dedication! Thank you so much for your generous praise! Yes, Foodie Pro does only have one dedicated recipe index (which I find a bit annoying), but I do have a tutorial about making another kind of recipe index to complement it, so maybe that will work for one of your uses? Perhaps if you are planning on selling some of them, you could consider using Woocommerce so people could buy them online. A Woocommerce page will be separate from the recipe index, so you could use the recipe index just for your free recipes? Good luck and thank you again for your infectious enthusiasm! Thanks for setting up these tutorials as they have been very helpful! One thing that I cannot seem to figure out: how to change my font size in the widget title. I’ve tried every possible thing in the Appearance Editor. Is there something I am missing? I would change this in the style.css file (full instructions about accessing that file in the tutorials). Do a search for the .widgettitle bit and you can change the font size as you fancy! THanks so much for all of the Foodie Pro resources you have put together. You have helped me immensely with getting a better recipe index up and running, and with placing my subscription bar at the very top of the site. One weird thing I have noticed is that I cannot seem to enable comments on my pages (they work fine on the posts). Even though I have the ‘allow comments’ option selected on the individual pages and the ‘allow comments’ option selected in my WordPress discussion settings. Have you happened to come across anything that might be causing this? You know, I had the same problem. I think it’s something to do with the theme. In the end, I gave up and changed a page I wanted comments on to a post instead. Not an elegant workaround at all! Hey there. Thank you so much for the tutorials. I’m wondering if you have a tutorial specifically to just make the header area bigger. I created a header image that is 800×340 which is what the theme recommends and then makes you crop too before saving, but this is too small and the image looks tiny and weird. I really want it to be the full width of the screen, not just a small part of the header. Can you help? Is there code to make it the full width for the header area? Thanks for your help. It looks like you’ve accomplished this with your own blog. Apologies for the delayed reply – I am working in Italy for a couple of weeks and I have discovered that there are places in the world with hardly any internet! Do you mean for my Delicious from scratch header? I’m not using a header image here, it’s just text. I loaded the Google font that I needed into the style sheet and set the header to use that font. One of the problems I discovered with using a large header images is that it looks really bad on mobile – have you any idea how your header would look when shrunk right down to a tiny screen? Thank you so much for sharing all of these excellent resources! One question I had was how do you center the page title text on the archive pages? For some reason mine default to left aligned and I want them centered under the image. My recipe index page is fine but the text on my archive pages defaults to left aligned. Thank yo for the help! Try and find this code yourself by right clicking on the thing on your website you want to change and select “inspect element” or something similar. That will show you all the code for that element of your website and you can experiment with the code there and make live changes, without your actual website being changed at all. When you’ve worked out what the code is, you can change it in your css file. Thanks for the quick response. I just tried adding that code and it didn’t work so I’m going to submit a help ticket to Foodie Pro. Sometimes you need the !important part to override another piece of code that is influencing the one you’re trying to change (you can see which other codes might be doing this when you inspect that element as I described before. Let us know how you get on with support if that doesn’t work – I don’t think they offer that kind of help, but maybe you’ll get a solution! Are you using the ‘read more’ insert in your posts? If not, what happens when you do, rather than relying on the WordPress automatic excerpt function? If that doesn’t work, is there anything at all that is different about these posts?